Hello and welcome to the Wee Bindery in North Carolina. I am going to meet with Marie today, who agreed to give us a tour through her workshop. Hi, and thanks for inviting us in! Why don't we start off with you introducing yourself to our readers? Welcome! 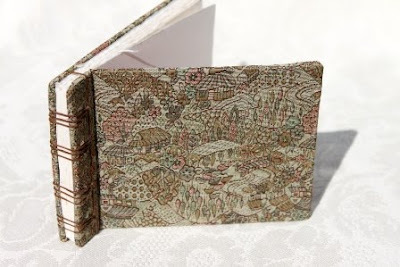 I am Marie aka Wee from Wee Bindery. - I design and create blank books, journals, sketchbooks and photo albums. I also love to sew, paint with watercolors and make lino prints. Location - Currently of North Carolina but originally from Massachusetts - USA. You named your Etsy-Shop the "Wee Bindery": Is your workshop particularly small, and are you Scottish? Yes and No. Yes, my Workshop is small, it's only me here but I am very busy and work every day! I spent a lot of time trying to come up with a name for my shop. I decided on Wee Bindery since Wee has been my nickname for a long time, and it represents most of my work - small books. And No, I am not Scottish. How and when did crafting and bookmaking come to your life? Both my mother and grandmother were seamstresses and were very creative. I learned to sew, crochet, paint, quilt and "create" before the age of 10. I have attended numerous bookbinding, painting and other craft workshops and have spent much time reading and experimentation over the years. The reason I love bookbinding so much and that my main concentration is books is because it incorporates everything I love to do! It incorporates sewing and painting to name a few. 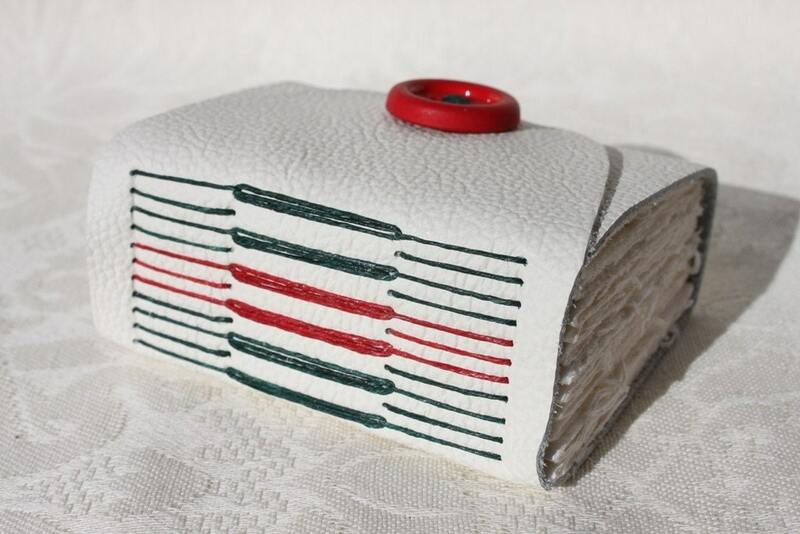 When I attended my first bookbinding course years ago, I knew that was want I wanted to do on a full-time basis! I absolutely loved it and still do! Not only do I love to make books but I am an avid reader and love to write in my journals. Do you have a day-job different from being an Etsy-Seller? I am a full-time Bookbinder and Artist, now. I have waited a long time to do what I truly wanted to do in life and that has always been my art. When I was young, I wanted to be an art teacher but followed the "business" route working 30+ years as a successful Paralegal and Realtor. During this period I always created on a part-time basis. I left the business world several years ago as a result of my husband's job relocation and his supporting me and my dream to be a full-time artist. I have never looked back! Let us talk a little about your shop and your craft. - How do you work and how would you describe your books? I design and create all of my own books. My favorite materials are vintage fabric, leather, beautiful Japanese and Italian paper and buttons. My antique book press is one of my prized possessions. I am a collector of new and vintage fabric, paper, buttons, yarn and unique embellishments. Since my first love is sewing, I love most the books in which the stitching is exposed. Is there a special way or place for you where you go to get fresh ideas? Art museums! I love to visit museums and look at the works of Monet, Raphael and the Old Masters. Also churches, music, history, architecture, Italy and the seaports of New England. Books are only a part of my artistic expression. I also love to paint so I really appreciate the styles, colors and skill of many painters. When you asked the question what inspires you - it really is everything in life. I look almost everything and say to myself, how can I paint that landscape or how can I make that quilt (as an example). Thank you for taking your time to talk with me, Marie. If you now want to see more of her books, head over to her shop and browse the shelves. lovely article. I love seeing Wee's space and hearing more about how she got into bookbinding. The stitching is so beautiful, i am glad it is exposed! Thanks for sharing all this with us! Nice to read more about Wee's background and her passion for her work. I own a couple of her books. Her work is beautiful and exacting. I love getting to know the artist behind the work. Your work is amazing plus you are so organized and tidy! This interview was really enjoyable to read. So neat to see Marie's work space and learn about her creative journey.